Google announced on Google+ a way publishers can earn money through embedding Google Consumer Surveys on their web sites. 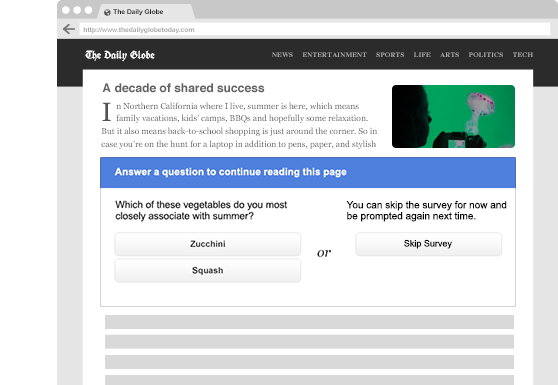 They will earn 5 cents per answer submitted via Google Consumer Surveys. The earnings go through Google AdSense, so you must have an AdSense account and most, if not all, the AdSense terms and regulations apply. Google is accepting publishers currently in the US and will expand it to the UK and Canada shortly. There is a detailed overview section in the help section with tons of details. One of the more important answers you'll need to review is the reporting dashboard so you understand the metrics. To sign up, go to this page. Google Consumer Surveys launched in May 2012 and then in June 2013 gave publishers the ability to embed them. Now Google is offering money per embed. 5 cents seems to low? Well, Google charges the survey creator 10 cents per answer, so it is a 50/50 revenue share.